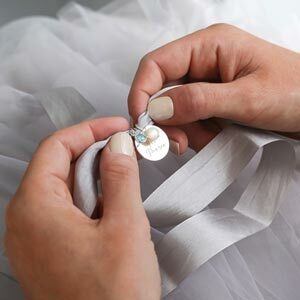 The Personalised Star Birthstone Necklace is a beautiful personalised shiny star and stunning Swarovski birthstone hanging on a beautiful rose gold chain. Our personalised star birthstone necklace is a fine chain necklace with a star charm and your choice of Swarovski birthstones. Personalise your necklace further by adding a meaningful letter or initial to the star charm at no extra cost. 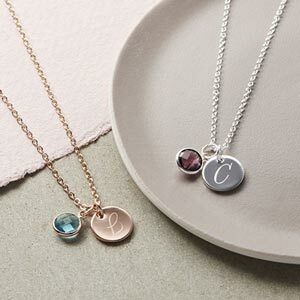 With the addition of the initial personalisation and choice of birthstone charms, this necklace makes the perfect gift for a loved one or as a very special treat for yourself. Personalised Star Birthstone Necklaces are available in children's size and standard size. FREE POSTAGE - All items are posted first class with proof of postage and are wrapped beautifully. Beautiful personalised birthstone necklace presented in a pretty box. Delivered promptly and in great condition. Quality is really poor, although I did not pay a fortune it looks like something from a cheap ebay purchase. Beautiful necklace and gorgeous engraving, beautiful gifts. Beautiful personalised pieces at affordable prices!